The advent of SGLT2 inhibitors, a new class of glucose lowering agent, currently represented by dapagliﬂozin (Forxiga)and canagliﬂozin (Invokana), offers a new mechanistic paradigm for treatment. Here, the authors consider the prescribing rationale and precautions, with an emphasis on the pharmacodynamic and kinetic properties of these agents. Now a new option is available: the sodium glucose transporter-2 (SGLT2) inhibitor class, currently comprising dapagliflozin and canagliflozin. SGLT2 inhibitors act independently of insulin to eliminate excess glucose in the urine (i.e. increase glycosuria). They do this by inhibiting the SGLT2 transporter in the kidney, which normally reabsorbs most of the glucose from the renal filtrate. Of the 12 isoforms of SGLT responsible for glucose absorption and reabsorption, SGLT1 and SGLT2 are of importance here. SGLT1 is responsible for dietary glucose and galactose absorption but has a much lower capacity than SGLT2 for glucose absorption. 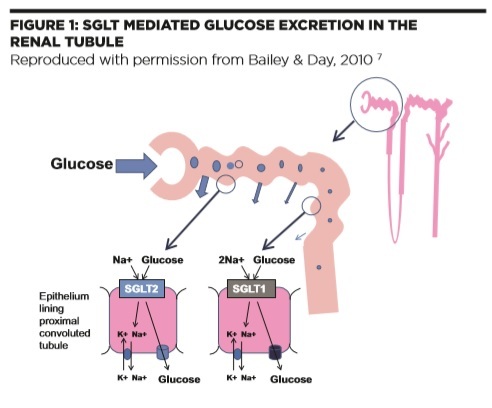 SGLT1 is found predominantly in the gut, but is also located in S2-3 of the convoluted tubule, whereas SGLT2 is expressed solely in the S1 segment of the proximal convoluted tubule (Figure 1).9,10 Thus, SGLT2 is responsible for the majority of renal glucose reabsorption and its inhibition by dapagliflozin and canagliflozin induces the “glucuretic” effect. Intestinal uptake of dietary glucose is essentially unimpaired, while active renal SGLT1 sites (with lower capacity) re- absorb any remaining glucose – thus guarding against hypoglycaemia. This “glucuretic” action is independent of both insulin and glucose but requires adequate renal perfusion to achieve clinically meaningful outcomes. Dapagliflozin and canagliflozin exert the majority of their actions on SGLT2, but their selectivity for the receptor varies: dapagliflozin has a 1200-fold affinity for SGLT2 over SGLT1, compared to the 250-fold affinity demonstrated by canagliflozin.11 This may have implications when considering side effects, glycaemic control and weight loss (see Clinical outcomes). T2DM is a progressive disease, thus therapies need constant up-titration and alteration to optimise glycaemic control; a personalised therapeutic approach ensures that treatments accommodate the requirements of patients as much as possible. So what about SGLT2 inhibitors? 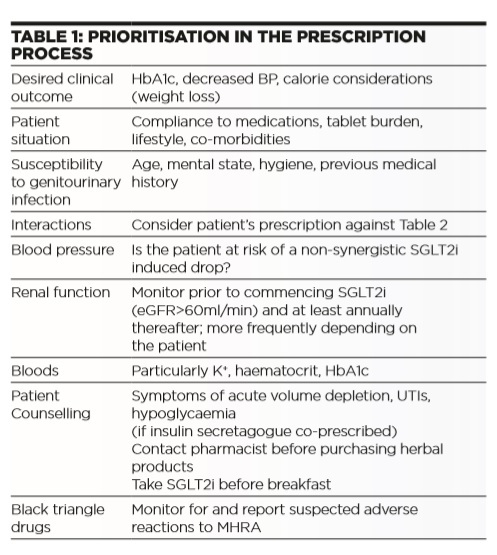 Considerations before prescribing are summarised in Table 1. SGLT2 inhibitors are not indicated for the treatment of T1DM. All ơ-adrenoceptor antagonists – including, but to a lesser extent, the cardioselective ơ-adrenoceptor antagonists – effect carbohydrate metabolism and mask symptoms of hypoglycaemia (including tachycardia).16 As SGLT2 inhibitors may be preferred in patients with frequent hypoglycaemic episodes, it may be inadvisable to co-prescribe these drugs. Although no dose adjustments are required in mild to moderate hepatic insufficiency, a 5mg dose of dapagliflozin could be prescribed in severe hepatic impairment, whereas canagliflozin would have to be stopped. Urinary tract infections (UTIs) were slightly more common with dapaglifozin in trial patients (4.3% vs 3.7% in placebo). UTIs were similarly more common in trial patients taking canagliflozin (4.3-4.9% vs 4.0% in placebo [dose dependent]).12,13 In both cases, the majority of infections were classed as being mild/moderate, responding to standard treatment and seldom necessitating SGLT2 inhibitor cessation. When prescribing a SGLT2 inhibitor, patients should be made aware of the symptoms of genito- urinary infections so that they can self-treat when symptoms first appear and thus avoid fulminant expression. They should also be advised to consult their pharmacist before starting treatment if they have difficulty distinguishing between a UTI and genito-urinary infection. Drug interactions are often not mentioned; however, they are a vital consideration in the prescription process. Potentiating hypoglycaemia with insulin secretagogues is not discussed here, as this additive effect should be considered when optimising glycaemic control. Note, however, that insulin secretagogue doses may have to be lowered when prescribing with a SGLT2 inhibitor, or at least up-titrated according to response. Interactions for consideration include those with potassium sparing drugs and cytochrome (CYP) P450 isoenzyme inducers such as phenytoin. 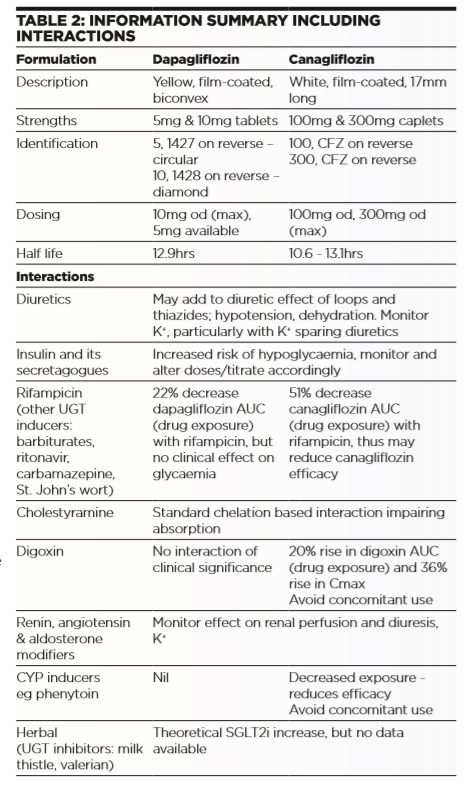 Special attention is warranted in the concomitant use of digoxin and canagliflozin (Table 2). Frequently discussed in isolation are coumarins; neither dapagliflozin nor canagliflozin had any effect on international normalised ratios (INR) with warfarin. All diabetic patients should be counselled on recognition and response to hypoglycaemic symptoms and the benefits of good glycaemic control reinforced.1 When patients are prescribed a SGLT2 inhibitor, they should be made aware of the symptoms of UTIs and genital mycotic infections and advised to consult their pharmacist before commencing self-treatment, especially if they have difficulty distinguishing the symptoms. They should also be advised to discuss the purchase of herbal products with their pharmacist. Considerations for older adults (≥65yrs) include increased risk of volume depletion, falls and raised susceptibility to UTIs. It may also be worth considering canagliflozin’s increased affinity for SGLT1, potentially resulting in raised intestinal glucose levels in the presence of gut flora. Tablet burden and compliance with treatment are of increasing concern with conditions requiring polypharmacy. Fixed dose combinations (FDC) should be considered; they are often no more costly than prescribing the individual drugs (provided that one drug is branded).4 Marketing authorisation has recently been granted for FDCs of dapagliflozin plus metformin (Xigduo) and canagliflozin plus metformin (Vokanamet). If a patient has mostly once daily medications, a SGLT2 inhibitor may be a useful option instead of twice daily sulphonylureas, for example. should be given to renal function (eGFR≥60ml/ min), risk of volume depletion and susceptibility to genitourinary infection. 1. IDF, International Diabetes Federation 2013. Diabetes Atlas 6th edn. pp11. Accessed via http://www.diabetesatlas.org/ December 2013. 3. Inzucchi S, Bergenstal R, Buse J, et al. Diabetologia 2012;55:1577-96 and Diabetes Care 2012;35:1364-79. 5. Bailey C, Feher MD 2009. Diabetes Therapies: treating hyperglycaemia. MedEd UK. Birmingham. 6. UK Prospective Diabetes Study (UKPDS) Group. Lancet 1998;352:854-65. 7. Bailey C, Day C. Br J Diabetes Vasc Dis 2010:10,193-99. 8. Day C, Bailey AV. Br J Diabetes Vasc Dis 2013:13,2-6. 9. Oku A, Ueta, K, Arakawa K, et al. Diabetes 1999; 48: 1794–1800. 10. Wright E. American Journal of Physiology: Renal Physiology 2001; 280: F10-18. 12. Canagliflozin: Summary of Product Characteristics 2013. Accessed via www.emc.org.uk December 2013. 13. Dapagliflozin: Summary of Product Characteristics 2013. Accessed via www.emc.org.uk December 2013. 15. Ferrannini E, Solini A. Nature Reviews Endocrinology 2012; 8: 495-502.